After a while, though, she began to realize that the perfect darkness was moving. It was moving faster than she ever could have imagined, swirling past her a amazing speed. Then it wasn't the darkness that was moving. She was the one. She could curve in long, dizzy sweeps. It was a living, leaping darkness, full of shapes that were just as free as she was. Luce knew at that moment that she'd never experienced anything nearly as beautiful as this power and this gracefulness. And at that moment of deepest joy, Luce began to hear the sound. The closest word for it was music. She thought the beauty of it must be more than she could bear. Abandoned by her mother and orphaned with the death of her kind but irresponsible father, Lucette is sent to stay with her uncle, a dark, often drunken and cruel recluse on the wild coast of Alaska. When he finally assaults her and leaves her lying on a cliff above the raging sea, she finds herself falling toward the sea, there somehow to be transformed into another being. Undead but not exactly human, Luce realizes that she has been somehow metamorphosed into a mermaid like the those of the tribe led by the strong and beautiful Caterina, who pulls her from the deep, shares her own breath with her, and explains the world which she has entered. It first to Luce it seems paradise found, a circle of fantastically beautiful girls who care for her, welcome her, and teach her how to live beneath the sea, nurturing her in a perfect society of sisters, all of them sharing the same human history of indifference and abuse. But slowly Luce learns that the tribe has another mission, to seek out passing ships, enchant their sailors and passengers with their otherworldly music, and lead them to their deaths, all in revenge for the abuse done to young girls in their world. Luce, as a novice, a metaskaza, goes along on their next hunt, and hearing the superb song of their queen, Caterina, she begins to sing, too, discovering that she has a music within her which already rivals the dominating song of Caterina. But there is something left in Luce, something of humanity's better nature, which feels sympathy, and even the beginnings of forgiveness, for the people her songs help enchant and draw to their deaths, and she is appalled at the ruthlessness with which the tribe pursues to the death the survivors who resist their siren call. At last she is even compelled to save one drowning boy, dragging him ashore on an island, a thing altogether forbidden by the Timakh, the mermaidian law. And then she secretly witnesses Caterina herself, consorting physically with a beautifully young man before she drowns him, an unthinkable and fatal rupture of the Timakh in their own queen. And when a new metaskaza, Annais, comes into the group, the close society begins to unravel. Annais is vain and shallow, pilfering the jewels and fine clothes from off the corpses of those she chooses to murder purely for their finery, conspiring to force a schism aimed at the overthrow of Caterina, and Luce comes to see that that spark of humanity which she cannot expunge from her own soul will not allow her to remain in that fallen society. There has been enough death,, Luce thought. Enough death to last until the world rolls away and leaves the sun forever. Many authors, most recently Stephanie Meyer in her Twilight series, have attempted to use the timeless tale of the mortal character forced to choose between immortality and power and the divine spark of the human capacity for mercy and forgiveness. It's a difficult task, requiring the author first to create a credible setting that is not exactly of this world, a "middle earth" (or in this case a middle sea ) and then to introduce that fatal choice believably into the plot for his or her protagonists. 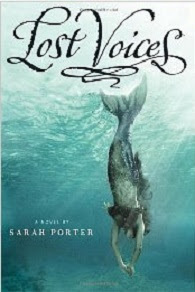 In this regard, Sarah Porter's forthcoming Lost Voices (Lost Voices (Trilogy)) (Harcourt, 2011) succeeds in a way Meyer's blockbuster best-selling romance series does not. More the primal tale of fallen angels rather than Meyer's daemon lover reprise, Porter's novel, graced with seductive lyrical writing, beautiful and seemingly effortless in its descriptive passages, does not flinch nor punt (as does Meyer) when it comes to the ultimate moral choice she places before her character. This is perhaps not a book for everyone: there is a depth of theme here which also requires a heavy measure of that "willing suspension of disbelief" required of the fantasy quest. Readers will finish the book with a feeling of dissatisfaction that Luce's coming-of-age transformation is not completely realized until they learn that this is but the first book of a planned trilogy, Porter wisely choosing not to issue the full story in one vast unwieldy volume. Much depends upon what is yet to be written, but Lost Voices (Lost Voices (Trilogy)) offers an impressive debut and much promise. This sounds in a way creepy, but also fascinating. It sounds like an interesting book, though and I put it on my TBR list. Thanks for the great review.